Click on Sitemap for larger image. The day-time stages and children's activities are free but if you want to make the most of the festival please look at the ticketed events in the church and village hall and buy tickets in advance. There will be a range of excellent food and drink available at the festival and from the local pub. If the weather looks changeable then do bring appropriate clothing and footwear. Visitors compliment us on our friendly village atmosphere. We are very grateful for the support the village gives us and without which the festival would not be possible. We do want you to enjoy yourselves, but please act considerately to residents, especially when parking and if you are outside late into the evening. To get driving directions please see map. The postcode of the village is BA2 9EE, but parking is available close by (postcode BA2 9EH). Please drive carefully through the village, which will be full of people enjoying the festival. Follow directions for Parking (£4 per car - free before 11am). Parking is in a field so if the weather is wet do bring suitable footwear. Camping/overnight stay in the Festival Car Park is NOT permitted, but nearby camping can be arranged with a local farmer (please email). The Village Green will be populated with stalls and people and is a No Parking Zone. Please use the car park. Thank you. Please do not park in any coned-off areas in order to ensure an orderly flow of traffic through the village and to keep access for emergency vehicles free. 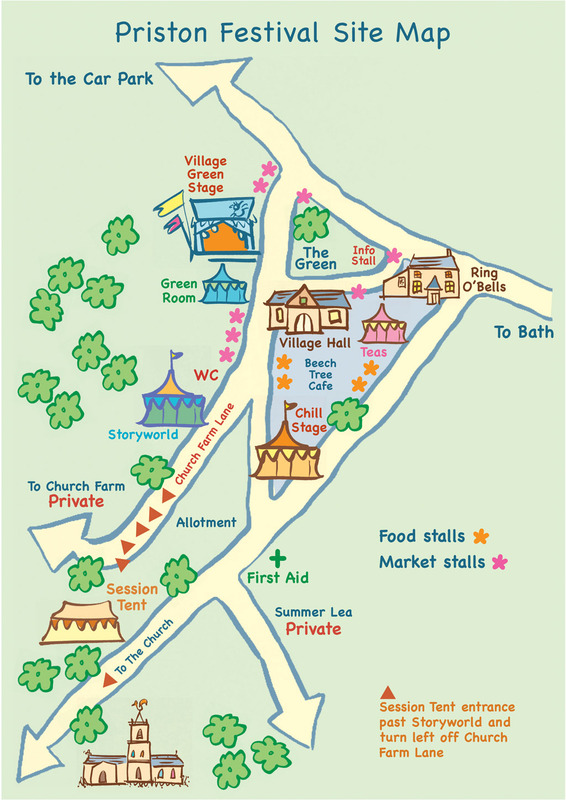 If you live locally, then why not walk to the festival (about 2 miles from Timsbury). Alternatively, you can catch the 179 to Tunley. Note the 768 service to Priston no longer runs at the weekend. If the 179 bus is dropping you off at Tunley ask to be dropped off at the Longhouses bus stop and walk down the lane to Priston (1 mile including steep hill) - but do take care of the traffic. Alternatively, you can be dropped off at the King William bus stop and walk across the fields to Priston (0.8 mile) - note the paths can be muddy after rain. See the Festival map for locations/routes. Priston welcomes disabled visitors, in line with its Equal Opportunities policy. The Church and Village Hall have provision for wheelchair access and there are toilet facilities suitable for use by disabled visitors. Most of the rest of the site is level and surfaced with tarmac. There is also specific provision for nearby parking for disabled drivers (but our small site means that spaces are limited, and provided on a first come first served basis), and for dropping off disabled passengers near to the Festival area. If you require special assistance please make this known to any Steward or Security staff on arrival. If you have specific concerns or requirements please contact us on pristonfestival@googlemail.com in advance of your visit. You can find details of local B&Bs and camp-sites on the Accommodation page of the Priston Web. You can also find details of local holiday cottages at www.myfavouriteholidaycottages.co.uk. Details of local hotels can be found at Cheaprooms.co.uk. There is no camping at the festival itself but nearby camping can be arranged with a local farmer (please email).